Additive Manufacturing, or most commonly 3D Printing, is a revolutionary manufacturing technology which has disrupted the industry. Due to its varied applications and significant benefits, it is also one of the most versatile technologies of all time. 3D Printing is not a single process but a set of technologies which operate on similar principles of additive manufacturing. Multiple technologies have emerged over the years such as FDM, SLA, DLP, SLS, MJP, CJP, Binder Jetting, Rotational 3D printing, Cold Spray AM, and many more. All these technologies offer different solutions for different applications of 3D printing and currently are at various levels of technological developments and acceptance. Let us look at one such technology called Selective Laser Sintering (SLS). It is one of the most widely used 3D printing technologies in the world. This article does not explain all about SLS Technology, but simply the working of SLS technology. Scanning System: This system perfectly directs the laser to the desired location and then traces the geometry for each layer. 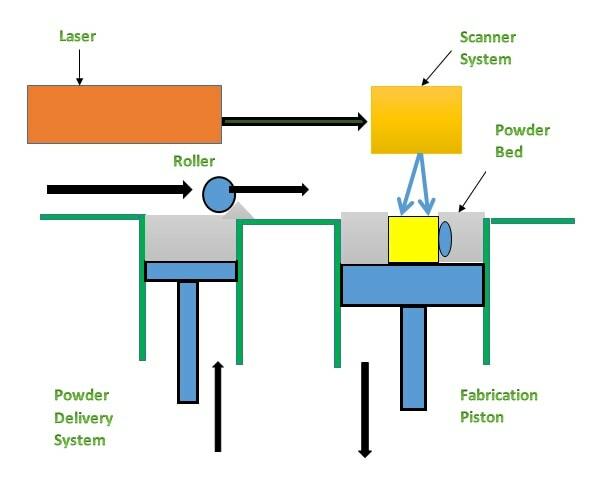 Powder Delivery System: The powder delivery system is responsible for carrying and delivering the powder for each layer of printing. Roller or Leveller: This transfers new layer of material from the powder delivery system and spreads it evenly on top of the previously printed layer in the build chamber for next printing cycle. The process starts with the build chamber being heated just below the melting temperature of the powdered material. On reaching the preset temperature, the roller brings the first layer of material and spreads it in the build chamber. Once the layer is spread the laser springs into action. The powerful CO2 laser is activated and falls on the scanning system. The scanning system directs the laser to the accurate coordinates and traces the desired geometry on the first layer of the material. As the laser falls on the fine particles, they are heated above its melting temperature and adjacent particles fuse together to form a bond. This process is also called as Powder Bed Fusion or Sintering. This completes printing of the first layer. On completion of the first layer, the laser pauses and the build chamber drops down by approximately 50 to 100 μm. The default layer height used in SLS printing 100 μm. In an SLS machine, almost all of the parameters are preset by the machine manufacturer and there is a limitation on the manual modifications by the machine operator. Once the bed drops, the roller brings a new layer of powder to the build chamber again and spreads it on top of the previous layer. The laser again starts and traces the next layer of the material in the build chamber. This time the adjacent particles are fused together along with the fusion of current and previous layer forming two completely bonded layers. This process continues till the complete object gets printed. It must be noted that SLS printing does not need support structures as the unsintered powder acts as the support structure for the actual object. It must be noted that the printing always starts from the bottom layer and is printed to the top. The build chamber is allowed to cool before the part is removed. This can take a significant amount of time. Once the part is removed it is cleaned by blasting it with compressed air. Parts made in SLS machines are gritty but are layer lines are not as prominent as in the case of FDM. It can be further post-processed by bead blasting, dyeing, painting, powder coating, tumbling, stove enameling, metal coating, lacquering, etc. Since SLS uses materials in a powdered form and the printing occurs inside a build chamber, the build chamber is always filled with the material. This proves to be a double-edged sword. Since the chamber has to be filled with powder, the material is heated every time an object is printed. This affects the material properties and after a specific number of times, the material loses its standard properties and it cannot be reused again. And positively, since the powder engulfs the object, it can be used to build several parts simultaneously in a single run. This helps in optimum use of the machine and material. SLS is most suited for a single piece or small quantity production of high-quality parts. Therefore, Aerospace industry is the biggest beneficiary of this technology.